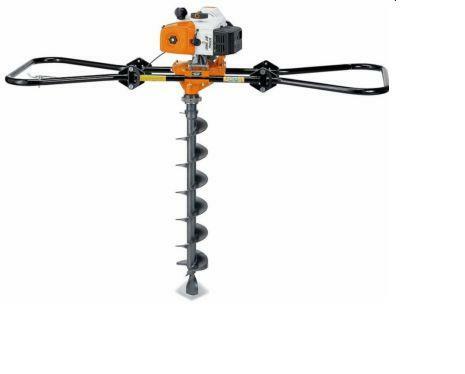 Hand drill with powerful petrol engine and various wood drills for holes up to 25 mm in diameter. With qucik release chuck, two-speed gearbox and reverse gear for the releasing jammed drill bits. Can be started in idle position without rotation tool. One-man earth auger with innovative QuickStop drill brake. Particularly for a large variety of purposes, from drilling simple holes in the ground to taking soil samples. Standard with equipment padding. Powerful two-man earth auger with 3 kW power output and hinged carry frame. Suitable for a large variety of tasks from drilling holes in the ground to taking soil samples. Compatible earth auger bits in diameter: 90, 120, 150, 200, 250, 275, 350 mm.